This interesting BBC Future article by David Robson asking if mobile ‘phones could help diagnose rare diseases like Ebola‘ got me thinking about some conversations I enjoyed at this weeks Wearable Wednesday and Google’s EMEA Performance Summit (an event for the biggest Google Ad account managers in Europe). We live in a strange world where some of the smartest people are creatively using data to get citizens to click on things while the world of public health experts remain so far behind the curve that they’re still asking if the accurate collection of data in the first place is even a worthwhile activity. It won’t be less than 6 months before there will be an effective Ebola point of care test available (access to testing facilities and blood samples is a massive problem that could delay this further) and I think we’ve got to realise it’s vital that we ensure these medical devices have their own embedded mobile connectivity (read more about how this has been achieved by reading this post on Telcare’s M2M Glucometer for Patients with Diabetes). 1) To contain the virus it’s critically important that we know precisely when and where Ebola is being tested for and are notified without delay when it is being found. These devices need to be used anytime anywhere and the operators shouldn’t even have to think about how the device is connecting. Timing is very important and data availability to management is key to coordination of efforts and the effective and timely application of resources. 2) The cost of adding M2M connectivity to devices is only incremental but it will ensure frontline staff are actually doing the testing, ensure they themselves can be identified/monitored if they are exposed, and that Patients with the virus who are being discovered are automatically counted and protocoled follow up can be properly resourced and tracked. 3) While it might seem to be favourable to have a touch screen interface (as you have with your smartphone or as featured on the Livongo Health m2m glucometer prototype) it would be much more desirable to be able to operate the device whilst wearing protective clothing (eg. the tactile buttons that the Telcare features – for use by Diabetics who are elderly, have peripheral neuropathy, etc – would also be easy to use by surveillance staff wearing protective gloves). 4) It’s key that the devices use dedicated professional hardware that is robust and capable of tolerating chemical reprocessing and ensuring test strips being used are not counterfeit. Trust in the device could be impacted if just appeared to be a conventional mobile phone (it would be easy to make a fake one for example) and there is always the possibility that after being contaminated with blood such a mobile phone based device could be sold on where it might infect buyers of used mobile phones. 5) With the virus developing so quickly and affected citizens being detected all over the world it’s key that the devices can be updated over the air (eg. to work with newer test strips that might check for other biomarkers, to add/modify device manual/languages, to enable sensitivity levels to be changed, etc) yet cannot be interfered/tampered with. 6) An always connected dedicated device can be a great bonus in defending citizens from the fake device/strip market that will inevitably take off very quickly when word gets out that there are genuine Ebola POC devices available. 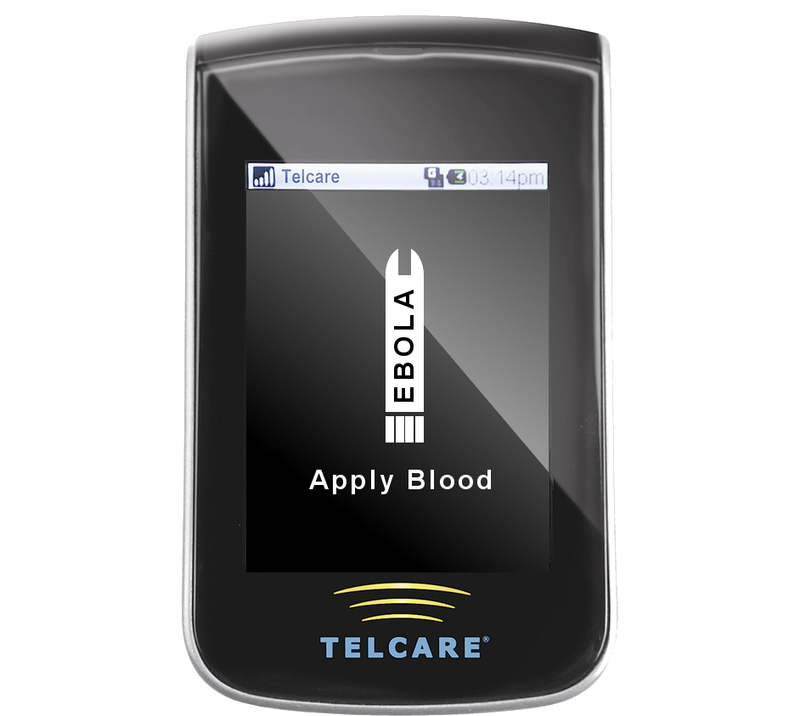 Can you think of any other reasons why we should insist that certified Ebola Point of Care testing devices are M2M connected? Do you realize how infectious is Ebola? This ain’t diabetes. POC Ebola tests are going to have to be 100% self contained, ie no sample exposure to tester whatsoever. Sterilization of reusable devices is critical. How do you propose to do that? Important to think like an infectious disease specialist, not a techie. Interesting comment. Presumably you’re trying to pretend you are an infectious disease specialist? Are you aware that this seamlessly connected glucometer is used today completely independently by Patients? Why would that same process not be desirable for Ebola testing so that you don’t have Patients ever in direct contact with testing personnel (who could for example watch Patient(s) on CCTV and instantaneously receive confirmation of the test being taken and the result(s) at their workstation)? Why do you think an Ebola testing device would need to be handled by a Patient being tested in a way that is similar to how a diabetic might use/handle their glucometer to self monitor their diabetes?